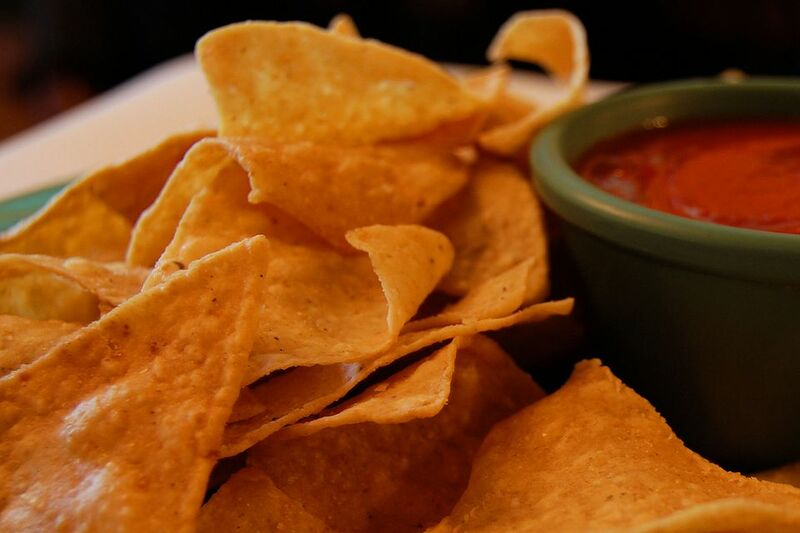 Known as tortilla chips north of the border, totopos are those fried or baked triangles of corn tortillas that are always served as an appetizer with salsa in American-style Mexican restaurants. They are also used to make nachos and, sometimes, chilaquiles. Totopos are well-loved in Mexico itself, though there they are used less often and usually in smaller quantities than they are in the United States. A couple of these chips might serve as a garnish, stuck artfully into a serving of refried beans, or be ​served with guacamole as a party snack or botana. Though easily obtained commercially nearly everywhere these days, you might want to make your own totopos just for fun and/or to take advantage of those leftover tortillas are a little too old and dry to use for tacos but that you can’t bear to throw out. Don’t miss the variations for multi-colored, baked, and seasoned totopos below the basic recipe. Did you know? Totopos differ from Frito-style corn chips in that the maize used to make the tortillas from which the totopos are cut undergoes nixtamalación, (a process involving soaking and cooking the grain in an alkaline solution), changing its texture and flavor and improving its nutritional qualities. Regular corn chips are made from simple corn meal molded into a particular shape. This recipe is a great reason to get out your deep fryer (following manufacturer’s instructions), but if you don't have one, use about 3/4 cup of oil in a medium-sized frying pan. Heat oil over medium-high heat for about a minute. Drop a crumb of tortilla into the oil; if it sinks, it's not hot enough. If it bubbles and comes to the top, it's perfect. Slide pieces of tortilla into the oil using a slotted spoon or spatula, frying just a few at a time. Let pieces fry until golden brown and crispy, which will take less than one minute. Drain on paper towels and sprinkle with salt. Serve your totopos immediately or store in a tightly covered container for later use. Mix about 1/4 teaspoon of paste (not liquid) food coloring with about with about 2 tablespoons of water. Use a brush to “paint” the whole tortillas with this mixture, using one color or several, as you wish, and painting on just one side or on both. Before cutting tortillas into wedges, lightly oil each side of each tortilla, either with cooking spray or with a brush dipped in vegetable oil. Bake in a 425 F (218 C) oven until somewhat browned, 7-9 minutes. For seasoned totopos, sprinkle desired herbs/spices over oiled chips before baking. Try powdered chile (piquín or chipotle, for example) chili powder (the kind used for making soup), dried epazote, or a mix such as Cajun spices, 4-pepper mix, or your favorite blend.